Bienvenue à la rivière La Case de Hannah, une belle retraite en bord de mer qui offre une cabine confortable, avec 2 lits doubles, sofa, TV et cuisine. Cette propriété a une belle terrasse avec un bain à remous et l'accès à la rivière. Juste un mile à l'extérieur de la ville, cette maison peut être réservé comme une petite escapade ~ ou peut être combiné avec la rivière Haus Hannah (la propriété suivante porte) pour un logement plus grand. Cette maison a son propre bain à remous, d'une allée et cuisine ~ un séjour abordable à Leavenworth. Note * Ceci est une cabine de style loft et dispose étapes très raides, pas idéales pour les enfants âgées ou petites. I was very impressed on how clean and new everything was! Perfect size for 2-3 people. Hot tub was very clean and couldn’t ask for a quieter atmosphere. We plan on booking this cabin again. The amenities were nice and it was close to attractions, the beds were hard to sleep on but we had a fun time. We loved the cabin. Glad I read reviews so I knew what I was getting into. The stairs are crazy steep. Need to replace the dinning room chairs and the bathroom is micro but I knew that heading there. The hot tub definitely doesn’t have much privacy with the auto shop 20 feet away. DO NOT STAY HERE DURING THE WEEK. At 7am the trash truck came through and the auto shop was definitely banging things around. Definitely no sleeping in that’s for sure. On the weekend though this place is perfect. Pretty view and comfy furniture. 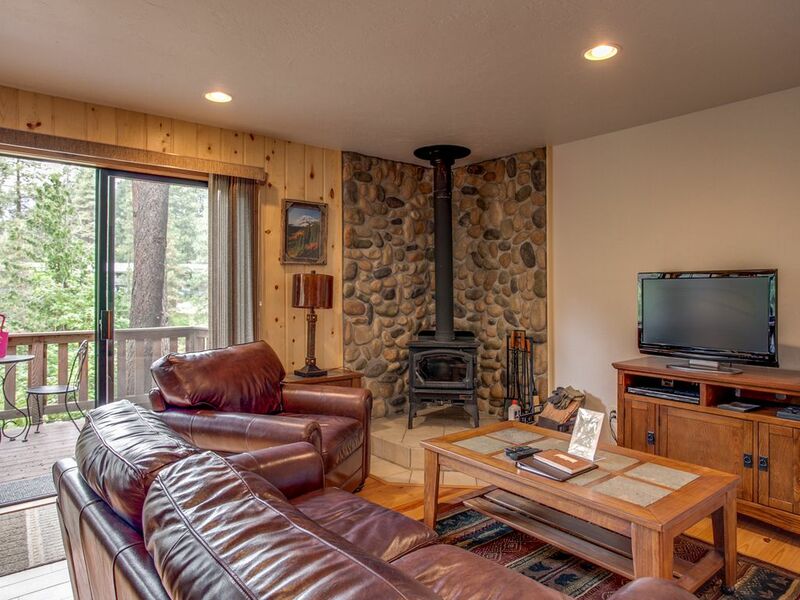 Very nice cozy cabin, beautiful property and great accommodations. Would recommend to anyone looking to get away and enjoy a little privacy. Good clean place with a nice view of the river from the hot tub. Great little cabin for a weekend getaway! The cabin was easy to find and the owners were great to work with. Perfect cabin for the two of us for the weekend, close to everything in Leavenworth, but out enough to be quiet when you wanted it. Great forest views out the windows and bird and wildlife watching along the river. Had everything we needed in the cabin, kitchen, and bathroom and everything was nicely maintained. It was a great weekend getaway. Thank you for letting us stay!